Being a customer oriented organization, we are engaged in providing a wide range of Cotton Candy Machine. Candy floss Making Machine, which includes toffee cooker, cooling plate, batch roller, rope size, toffee cut and wrapping machine. Developed by premium grade raw materials under strict quality supervision, these machines are offered in various sizes. 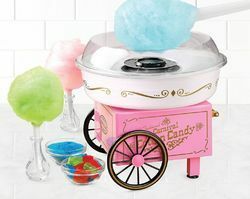 To furnish the diverse requirements of our clients in the best possible manner we are involved in offering an extensive range of Candy Floss Machine Electric Operated.